The first week of August will see fewer scheduled auctions across the combined capital cities when compared to the week prior, with CoreLogic currently tracking 1,707 auctions this week, decreasing from last week’s final results which saw 1,987 capital city auctions held, however, the number of auctions will be higher than the 1,540 auctions held over the corresponding week last year. In Melbourne and Sydney, auction activity is expected to decrease across the two major markets, with 846 Melbourne homes scheduled to go to auction, down from last week’s 956, and 562 auctions scheduled across Sydney, decreasing from the 714 auctions held last week. 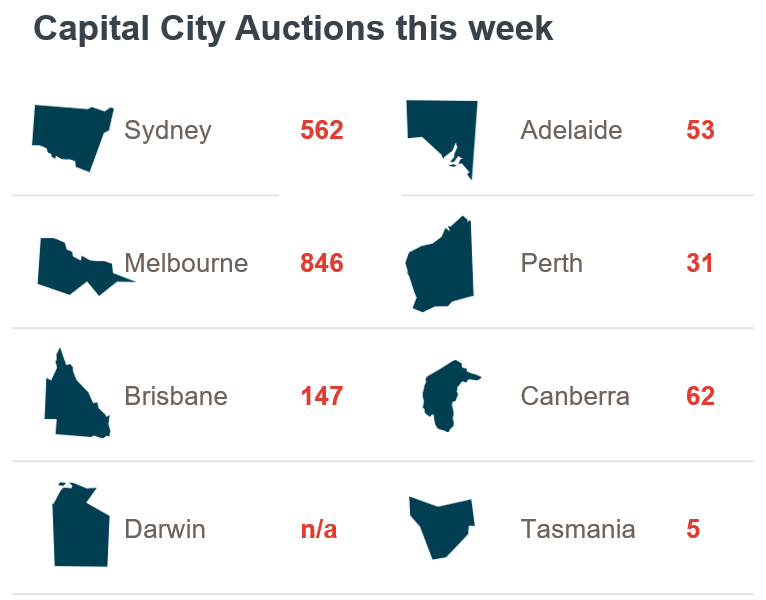 Across the remaining capital cities, the number of scheduled auctions will be lower in Adelaide and Brisbane, while Canberra, Perth and Tasmania will see an increase in volumes week-on-week. For the 5th week in a row, all of the busiest suburbs for auctions were in Victoria, with 17 homes scheduled to go to auction in Craigieburn this week, followed by Reservoir (16), Bentleigh East (15) and Kew and Mill Park with 13 auctions each. Last week, the final auction clearance rate fell across the combined capital cities, with 68.7 per cent of the 1,987 auctions reporting as successful, down from the previous week when a clearance rate of 69.9 per cent was recorded across a lower volume of auctions (1,748). Looking at results from one year ago, the clearance rate for the combined capitals was a higher 72.0 per cent, across 1,610 auctions. Across Melbourne, the final auction clearance rate increased to 75.6 per cent last week, across a higher volume of auctions week-on-week (956), over the week prior volumes were a lower 833 with 73.8 per cent clearing. In Sydney, the final clearance rate for the city fell last week, recording the lowest clearance rate year-to-date (65.4 per cent), down from the previous week when the clearance rate increased to over 70 per cent after remaining in the high 60 per cent range for 6 consecutive weeks. However, auction volumes were higher last week across the city, with 714 auctions held increasing from the 625 over the week prior. Across the smaller auction markets, clearance rates decreased last week across the remaining capital cities, with the exception of Brisbane which saw an increase over the week. The Gold Coast was the busiest non-capital city region last week, with 80 auctions; however Geelong recorded the strongest clearance rate at 82.1 per cent. ← Depreciation dilemma: Is it better to buy new or old properties?